Have you ever wondered how anti-vaxxers spread their message? It’s not just through spamming facebook and instagram feeds with their tripe, it’s also through advertisements––particularly through social media. GoFundMe plans to put a stop anti-vaccination fundraisers that help spread the anti-vaccination gospel. Larry Cook, for example, a prominent anti-vaxxer, raised nearly $80,000 through several GoFundMe campaigns. 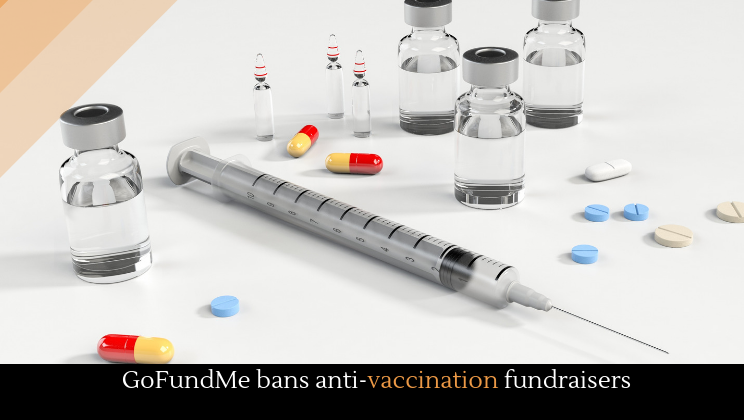 A variety of anti-vaccine groups also use GoFundMe to raise money for their funds. They believe GoFundMe’s ban on their fundraising constitutes a violation of their First Amendment rights. GoFundMe’s decision follows a rash of disease outbreaks. Unvaccinated children are causing outbreaks all over the world, especially of measles. The anti-vaccination movement is spurred by the (mistaken) belief that vaccines are tied to autism. Not that it will matter, but another study has just demonstrated with a respectable degree of certainty that there is no connection between autism and vaccines. Over 650,000 children were observed in Denmark, 95% of whom were vaccinated between 1999 and 2010. The data revealed no increase of instances of autism among both children who were not at risk of it (based on genetics) and those who were at risk for it. There have been 17 studies that confirm the same thing, but the belief that the two are linked––which began in 1998––remains.